The Pie Chart Control displays information which is represented by percentages. 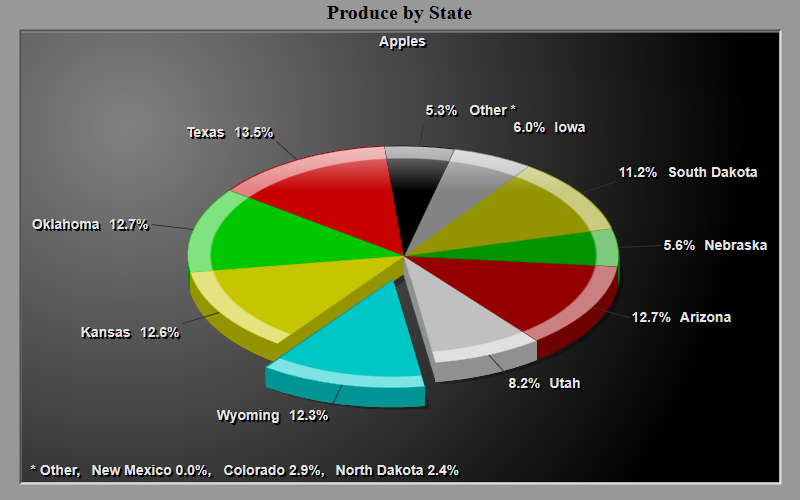 For example, it can show the percentage of total sales per produce item. The developer passes one data-set XData, with an option to pass a second data-set identifying default slices to explode via YData. 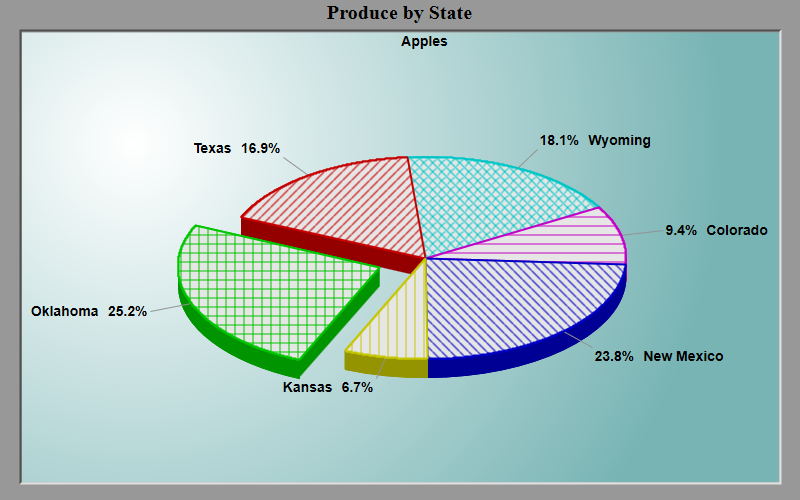 Within the demo, see example 300 to learn how to create a simple Pie Chart Component . Like the Graph, Scientific Graph, and Polar/Smith components, the Pie Chart component has vertical scrolling capabilities which allow the user to scroll through subset information. However, only one subset can be viewed at a time. 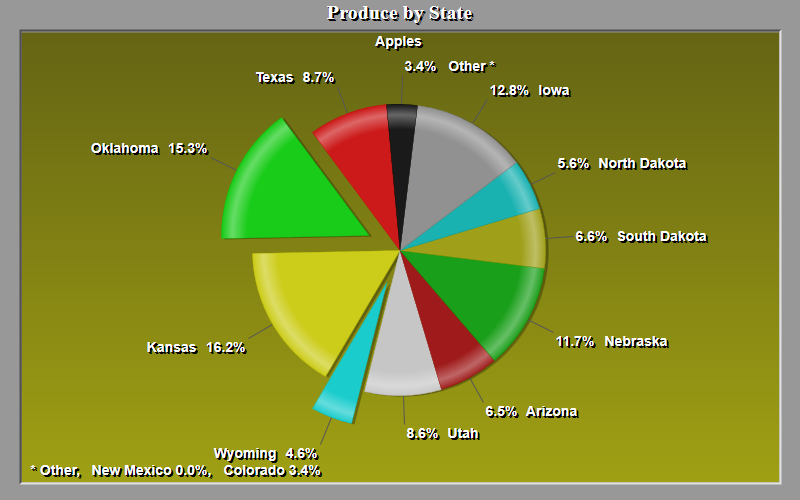 The Pie Chart component has an innovative feature which combines small sliver type slices into a single *Other slice. This feature improves the readability of unpredictable data. See GroupingPercent. The Pie Chart control has a feature that lets the user automatically explode slices by double-clicking the slice's label. See AutoExplode. For legend and hatching logic. See ShowLegend and SubsetHatch. The Percentage of Pie selection causes the Pie Chart control to display slice percentage values next to the pie slices. The developer sends the component regular quantities for slice values. 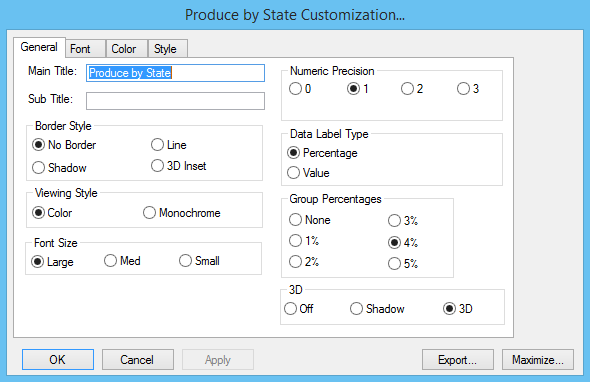 The component will determine the percentages to be used in slice labels. If the Numeric Value option is selected, the Pie Chart component displays the slice values set by the developer. See DataLabelType. This customization controls the size of pie slivers that are grouped into the *Other slice. More than one sliver must exist in order to form the *Other slice. In this case, the Pie Chart places a footer note at the bottom of the control to notify the user of the contents of the *Other slice. If no slivers exist and a slice has a value of zero, then a *Zero footer note is placed at the bottom of the control to notify the user which slice(s) were equal to zero. See GroupingPercent. The Slice Parameters section controls various pie slice parameters. The Default Behavior selection causes the component to handle slices as the developer initialized them. If the developer set up default slices to explode, then these slices will be exploded when this option is selected. Custom Slices to Explode allows the user to choose which slices are to be exploded. Custom Slices to Chart allows the user to choose which slices are to be included into the image.